Our Verdict: The VaporFi Pro is a solid performer. Beginners, who want something more advanced than cig-a-likes, as well as advanced users looking for a powerful, but discreet device, will find what they’re looking for in the VaporFi Pro. Design: The VaporFi Pro is an attractive device. Sleek and very stylish, the device comes in a matte finish and is available in various colors. The rubber matte finish feels good in the hand and makes the device easier to hold. Colors of the tank and battery can be mixed and matched, as well, giving users the ability to customize the look of their setup. Also, the button on the device lights up when activated, which is a nice touch. Build Quality: Handling the VaporFi Pro, one would be convinced of its high-quality build. The finish is flawless and there’s some heft to it, giving users a sense of quality. There’s no doubt the device can withstand daily use; however, while the battery itself looks like it can survive high drops, the tank may shatter, so some degree of care should still be taken. What’s in the Box: Every purchase of the VaporFi Pro Starter Kit will give you one 650mah or 1000mah battery, one Pro-L, Pro-XL, or Pro-L II tank, one Pro Variable USB adapter, one wall charger adapter, and a set of instructions. Usability: The VaporFi Pro is simple to use. The tank can be refilled by removing it from the battery. Users should be careful not to spill e-liquid into the chimney that is inside the tank. It’s recommended to pour e-liquid along the sides. Once filled, the device can be used by pressing the button on its side to start producing vapor. Charging is done by plugging in the included cable to the bottom of the device. There is a steel cap that needs to be removed first. The other end of the cord is then plugged into either a USB powered source or the included wall adapter. Vapor Production and Performance: Vapor production from the VaporFi Pro is fantastic. Thick and flavorful, it also gives great throat hit with just the right harshness to mimic a hit from a traditional cigarette. Overall performance is good. 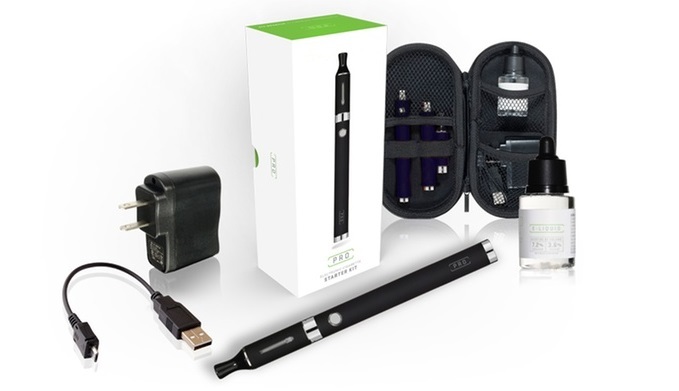 It is easy to use and has enough power and vapor production to satisfy both beginners and advanced users. The draw from the tank is smooth and the tank itself is able to hold 1.5ml of liquid. If more capacity is needed, there is also a 3ml tank available. Battery Life and Atomizers: The battery life of the VaporFi Pro is good enough to give users a day or two of vaping before needing a recharge. This is a substantial increase over the smaller vape pens and cig-a-likes that beginners often start with. The atomizer inside the tank has replaceable coils, which usually last a week or two, depending on the usage rate. Coils are sold separately, though they are cheap enough that users can buy several at a time. As mentioned above, the vapor quality and throat hit users get from the atomizer and tank is great, closely mimicking the feel of traditional cigarettes. For Beginners or For Pros? Overall, the VaporFi Pro is a great device for both beginners and advanced users. Beginners, who are looking for an upgrade from cig-a-likes and vape pens, will be satisfied with the VaporFi Pro. On the other hand, the Pro is perfect for advanced users who are looking for something small but powerful enough to use as a backup to their bulky mods. The price may seem steep, but looking at the overall performance of the VaporFi Pro, it is worth it. There is also a 90-day warranty and 30-day money back guarantee to give users peace of mind that their purchase is a sound one. Simple to use, portable, and powerful, the VaporFi Pro is a good buy for any serious vaper.